A look back. No anger. A car of the 21st century passes the oldest houses in England’s first recorded fort. This is Colchester, where the Roman Army set up camp to begin their onslaught of Saxon England. In the early morning the passing car does not regard these wattle and daub style tenements inspite of their bright colours. This strong city was until recently a modern military town. Things have changed since I last lived here and I celebrate this fast moving location with a trip to the bright shiny Mercury Theatre. 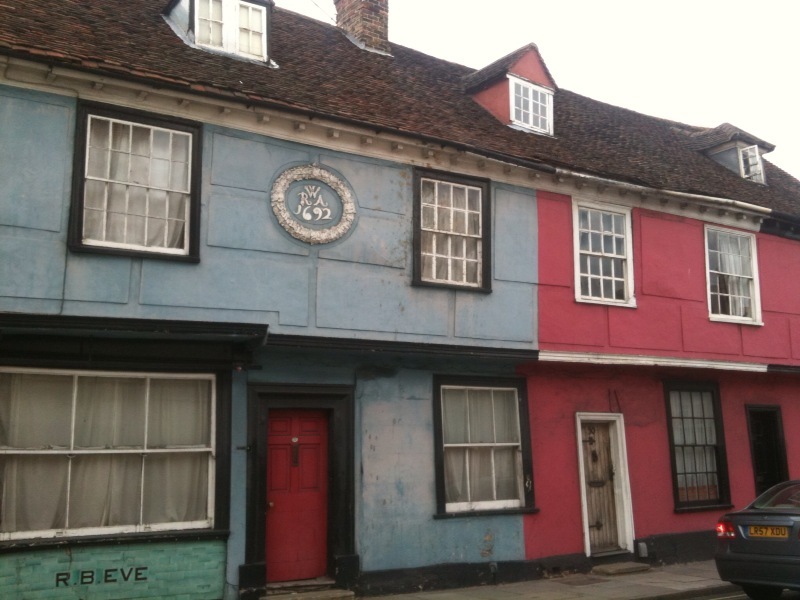 A matinee of local new writing, that is as colourful as these houses, is on the cards. I take a tip from the cars that are steadfastly making their way to London and along with the vibrant contemporary local theatre, look forward. This entry was posted in Uncategorized and tagged A Lingering Look at Architecture, local architecture, London, Saxon England, the Roman Army. Bookmark the permalink. I love your shot of the old houses, I really like the contrast of the different colours on them. Your description of the old and current completes your post. Thank you so much. Colchester definitely catches the imagination. It is so vibrant and full of youth culture but equally has such an old story to tell of Roman settlements. It’s interesting to watch these mix! Thanks for showing Colchester. I didn’t know of it when I was in England, it sounds like a charming place!